The last five weeks have been incredibly busy for me. My new book, Platform, launched on May 22. My daughter Madeline got married the next weekend. Since then, I have done seventy-three radio, podcast, magazine, and newspaper interviews. I have also had eight speaking engagements. To be honest, it has been overwhelming, especially because I am committed to keeping up with my blog and podcasting. It finally came to a head last week. I realized that if I didn’t take action now and regain control of my calendar, the train was going to come off the tracks. So, I went back and reviewed my Ideal Week (see image below). I learned a long time ago, the best way to change anything is to start with the end in mind. I didn’t worry about how I was going to make it happen; I first needed clarity about what I wanted my calendar to look like. In a word, I needed margin. If we were equipped with a flashing light to indicate “100 percent full,” we could better gauge our capacities. But we don’t have such an indicator light, and we don’t know when we have overextended until we feel the pain. As a result, many people commit to a 120 percent life and wonder why the burden feels so heavy. It is rare to see a life prescheduled to only 80 percent, leaving a margin for responding to the unexpected that God sends our way. Margin is not something that just happens. You have to fight for it. That’s why creating or re-visiting your Ideal Week is so important. The idea is similar to a financial budget. The only difference is that you plan how you will spend you time rather than your money. And like a financial budget, you spend it on paper first. 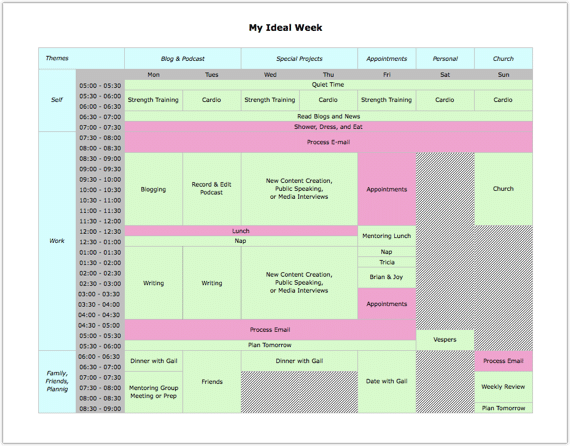 My Ideal Week—the week I would live if I could control 100 percent of what happens—is divided into a simple grid (see image above). Each day has a theme. In addition, each day is segmented according to a specific focus area. Last week, I discussed My Ideal Week with my wife, my assistant, and my two managers. I realized that I didn’t have any hope of implementing it unless all of us were aligned on my intentions. 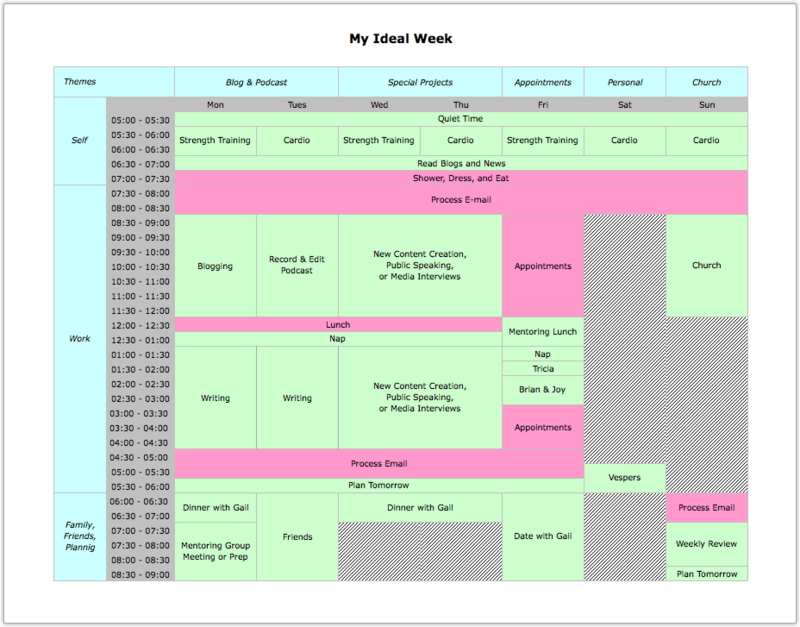 I then updated my Ideal Week spreadsheet and distributed it. Monday and Tuesday are devoted to my blog and podcast. This is the foundation of everything else I do. Wednesday and Thursday are devoted to Special Projects. This will vary from season to season. For the next few months, I will focus on media interviews and speaking. When I get ready to write my next book, I will focus on writing. If I have a speaking engagement, it has to come out of this allotted time. Friday is my day for appointments. Taking a page from my friend Don Miller, I am relegating all of these to one day a week. It is very difficult to write when I have any meetings on the same day. Saturday is for personal chores and recreation. Sunday is for worship, rest, and planning the next week. The early morning hours are devoted to self: reading, praying, and working out. I usually listen to audio books or podcasts while running. The end of the day is reserved for my family, friends, and (on Sundays) planning. Currently, we don’t have any children living at home. Consequently, Gail I eat dinner together almost every night, taking time to connect and catch up. This scheme is admittedly subjective, but it is helpful to me to make sure I am working on what matters most. Create a template. It doesn’t matter if you lay it out digitally or just draw it on paper. Identify your themes. This won’t be possible in every situation, but it is helpful if you can assign a theme for each day and then batch similar activities together. Schedule the important activities. These are the ones you will shade green—they contribute to your goals and priorities. Allocate time for these first. Fill in around the edges. Now schedule the less important activities. These are ones you will shade red. These items must be done, but they don’t really move you toward your goals. Tweak and fine-tune. I usually have to go through several iterations before I get it right. Share it with your team. If they are not aware of your Ideal Week, they may inadvertently sabotage your plans. But if you are aligned, they can help you stay on track. Don’t be legalistic. The calendar was made for man, not man for the calendar. If you are like me, not everything can be shoe-horned into the template. However, having this document will better enable you to to create the margin you need to get the important things done while still enjoying your life.